A former regional press journalist has written his first novel about the fictional life of a local newspaper reporter. 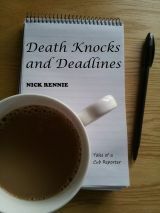 Nick Rennie, who started his career on the Melton Times in Leicestershire, has published Death Knocks and Deadlines as an e-book. The book tells the story of a fictional reporter called Alfie Ward and the challenges he faces getting to grips with his new career, while trying to make sense of a troubled love life. The plot starts in 1989 and moves to the present day, addressing the major changes in the industry during that period. Nick has based some of the characters and incidents in the book on memories from his 20-year career in journalism, which has included working for the Suffolk Free Press, Colchester Gazette, Bucks Herald and Leicester Mercury. He said: “I’ve always been surprised there have been so few novels written about local newspaper reporters. “There is so much humour in the job, whether it is in the newsroom or out on assignments interviewing weird and wonderful characters, and this is something I tried to get across in the book. Nick decided to go down the self-publishing route because of the difficulty in getting a publishing deal as a first-time author. This involved proof-reading the manuscript, designing a front cover and then uploading it to the Amazon website where it can be download on eReader devices such as Kindle and iPad. Nick added: “There is a saying that ‘everyone has a book inside them’ but until recently most of these books were never written because it was so difficult to get a publishing deal. Nick combines his writing with work as a freelance PR consultant and freelance journalist. His book is available to download by clicking here.